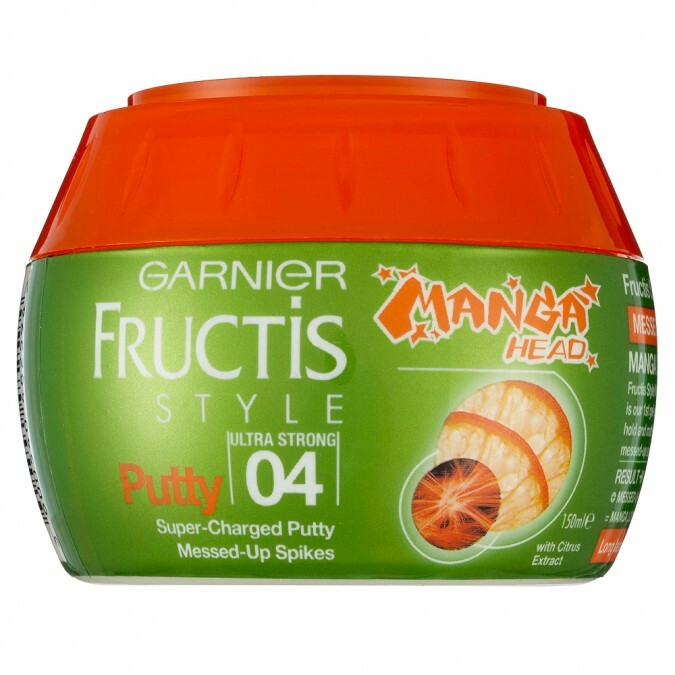 Fructis Style Manga Head Explosive Putty is the only gel-putty that allows you to create spiked-up, explosive, asymmetric Manga styles with a long-lasting matte effect. For long lasting messed-up spikes. Provides ultra-strong hold for a super-sized asymmetric Manga look with matte effect. Messed-up spikes, Matte effect, Long lasting extreme hold. Enriched with fortifying fruit micro-waxes, its non-greasy formula is designed to create extreme styles without drying or damaging your hair. Get ready: Apply the product to clean and dry or slightly damp hair for best results. Open the pot and warm a small amount of product between your palms. Get stylin': Work product through your hair for an unstructured look. Finally work the detail with your fingers to create a spiked-up look. 1082398 C - INGREDIENTS : AQUA / WATER, CERA ALBA / BEESWAX, PEG-100 STEARATE, GLYCERYL STEARATE, CETEARYL ALCOHOL, NIACINAMIDE, PHENOXYETHANOL, PEG-150/STEARYL ALCOHOL/SMDI COPOLYMER, PPG-1 TRIDECETH-6, POLYQUATERNIUM-37, MALTODEXTRIN, LIMONENE, BAMBUSA VULGARIS EXTRACT, LINALOOL, PROPYLENE GLYCOL DICAPRYLATE/DICAPRATE, PROPYLENE GLYCOL, CAPRYLYL GLYCOL, PYRUS MALUS EXTRACT / APPLE FRUIT EXTRACT, CARAMEL, SORBITOL, CITRAL, AMYL CINNAMAL, PARFUM / FRAGRANCE (FIL C47064/1).